Roman shades have been around for centuries in many different forms. Today, these classic shades are available in different styles and with various options, but they all offer many of the same characteristics at the window. Roman shades are typically a fabric shade that can be raised and lowered with a pull cord. They are made in different ways, creating numerous different styles. A flat Roman shade offers a more contemporary look, while a teardrop or looped style takes a more traditional approach to the window treatment. Since Roman shades can be made out of nearly any fabric – even sheers – there is definitely one for every style and every home. 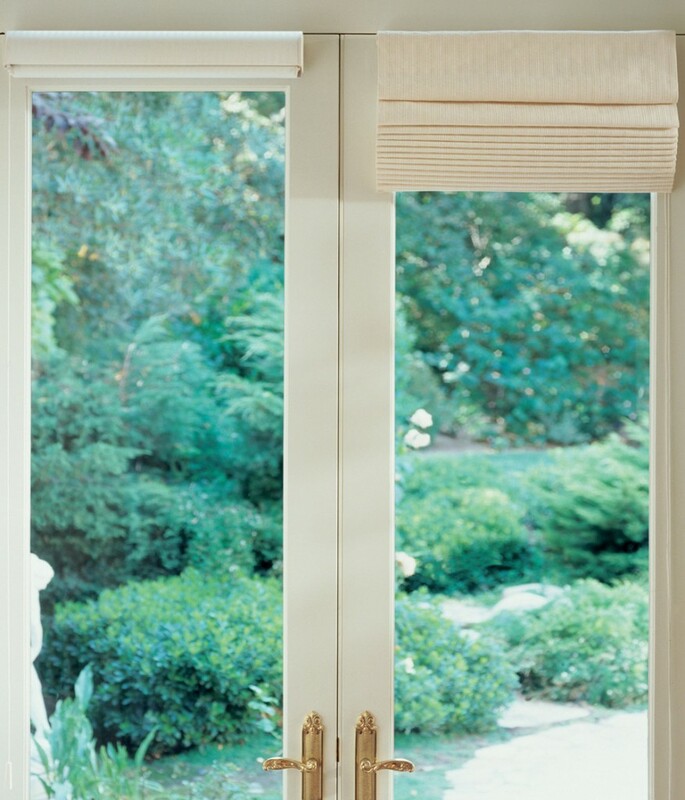 One of the biggest advantages to using Roman shades on your windows is their timeless style. Romans have been around for decades (in their present form) and tend not to cycle in and out of popularity with the latest trend. A wise fabric selection will extend the life of your shade by keeping it from becoming too trendy. 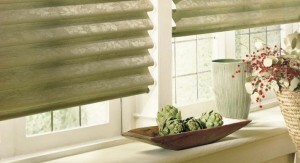 Roman shades also offer softness at the window, unlike some other hard window coverings such as wood blinds. Depending upon the style you select – flat, looped, balloon or dog-eared – the style of a Roman shade can move from soft and feminine (Like the one below from The Shade Store) to masculine and tailored. However, Roman shades do have some drawbacks. 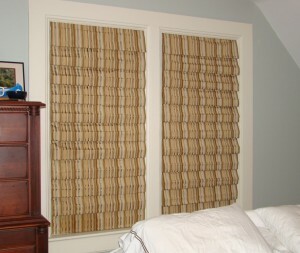 Traditional, custom-made Roman shades create a stack at the top of the window when they are raised. On a tall window, this fabric stack can add up, taking up a chunk of your window and minimizing your light and view. 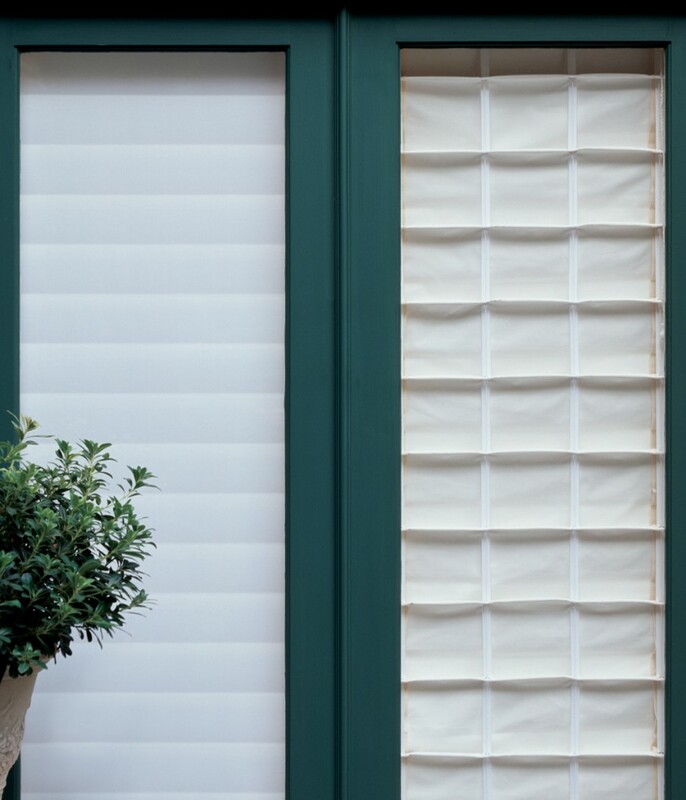 Newer Roman shade options, like the Vignette product from Hunter Douglas, avoid the problem of a large stack by rolling the fabric up into a headrail. This keeps all that fabric out of the way when it isn’t needed, but easily accessible when you need to lower the shades. 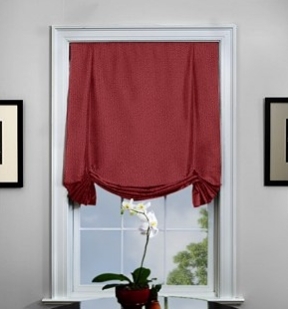 The stack of fabric can be an advantage, however, because it creates something of its own valance at the top of the window when it is raised, eliminating the need for a separate top treatment. A Hunter Douglas Vignette (left) rolls the fabric up into a sleek headrail, while a traditional Roman shade creates its own valance at the top of the window with the fabric stack. In addition, Roman shades do not offer the flexibility of having vanes to tilt open or closed; Romans are either up or down. While this is also true for honeycomb or roller shades, it is something to take into consideration when making your window treatment selection. Another potential issue with Roman shades is child and pet safety. Traditional Roman shades are constructed with a series of rings and strings along the backside of the shade. These strings can create loops when pulled away from the shade, creating a strangulation hazard for children and pets. While some custom drapery workrooms have adjusted their Roman shade construction techniques to be more child safe, not all of them have done so. Roman shades created by large manufacturers, such as Hunter Douglas or Graber, comply with the latest safety standards when it comes to child and pet safety. While the standards aren’t foolproof, they do offer some protection from the hazards Roman shades presented in the past. A Hunter Douglas Vignette (left) looks clean from the outside, and eliminates the loops and cords that can be child and pet safety hazards. Roman shades can be a beautiful addition to nearly any home. Take the pros and cons into consideration to make the best choice for your style and for your family. What is the ‘Stack’ of a Window Treatment?